T. W. Rolleston's Parsifal or the Legend of the Holy Grail is a poetic rendering of Perceval's quest for the Grail, inspired by Richard Wagner's 'Parsifal' and including details from other medieval sources, Wolfram von Eschenbach's 'Parzival', and the Welsh 'Peredur'. 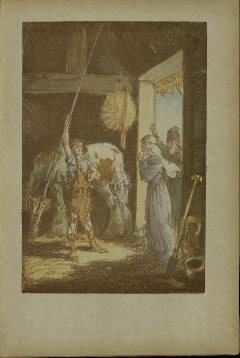 Indeed, among Rolleston's other works is a retelling of the Celtic tales (richly illustrated Celtic Myths and Legends), while Parsifal itself was later published as part of a trilogy, Three Love Tales after Richard Wagner: Tahnhäuser, Lohengrin, Parsifal (1920). The book itself is remarkable for its rich illustrations created by Willy Pogany: in addition to the colour plates, printed separately, each page boasts of monochrome border decoration, while numerous full-page drawings offer bold visual commentary on the text. In fact, the author suggests, in the introduction, that the textual and visual materials were designed to complement each other, so that the narrative would be incomplete if read without the accompanying art. 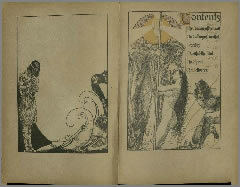 The contents page lists the six parts into which the narrative is divided: 'The coming of the Grail', 'The caking of Parsifal', 'Kundry', 'Parsifal the Fool', 'The Spear' and 'The Deliverer'. 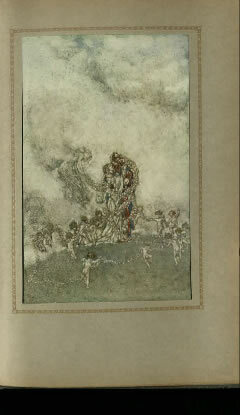 The drawing shows the seduction of the Grail king Titurel, by Kundry, the woman who was punished with immortality for neglecting Christ, but who was saved through Parsifal's innocence. Young Parsifal boasts to his old parents of his newly contrived knightly paraphernalia: an old nag, a shield and a heavy pole. The description of the equipment and the mount occurs not only in Rolleston's medieval source, Wolfram von Eschenbach's 'Parzival', but also in Chrétien de Troyes's 'Perceval' and the Welsh 'Peredur'. Parcifal finds his pure love, Blanid, a character not in Wagner, who was introduced by Rolleston as a foil for Kundry, the object of Parsifal's carnal passion. At the end of the poem, Parsifal becomes the new Grail king. 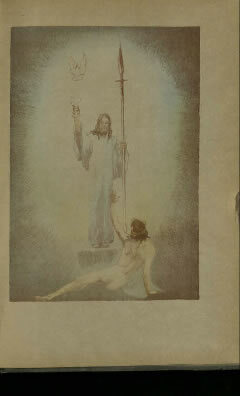 Both Rolleston and Pogany emphasise Parsifal's messianic role, representing him as a Christ figure or as a priest in charge of the chalice.